Crestwood’s Two New Directors of Operations! Welcome to our two new Directors of Operations, Michael Bargagliotti and Matt Yarwood! Michael and Matt will be joining Pam Norris, Crestwood’s Vice President of Operations and Cindy Mataraso, Director of Operations, in the oversight of our 22 campuses. Michael has worked for Crestwood for more than four years where he started out as the Administrator of Crestwood San Diego and Crestwood Chula Vista. In 2016, Michael then made the transfer to be the Administrator of the Crestwood San Jose campus, where he gradually reorganized the campus leadership and gained the experience of also operating a PHF. Matt comes to Crestwood with extensive experience in Skilled Nursing Facility leadership. He has been a licensed Skilled Nursing Facility Administrator since 2001 and has Regional Director experience, overseeing numerous facilities. Congratulations to Michael and Matt on their new positions! Crestwood’s new President and COO and VP of Operations! We are proud to announce that Derek Dobbins is our new President and Chief Operating Officer. Derek has been with Crestwood for 15 years and has been a Director of Operations and an Administrator of one of our largest campuses, Crestwood Manor Stockton. George Lytal is remaining at the helm of Crestwood as our CEO and will continue providing guidance, wisdom and oversight of our entire organization. Pam Norris has been promoted to Vice President of Operations and will lead in its oversight. Pam will continue to support us with startups and overseeing campuses. Crestwood at Transformation in Behavioral Health Panel! 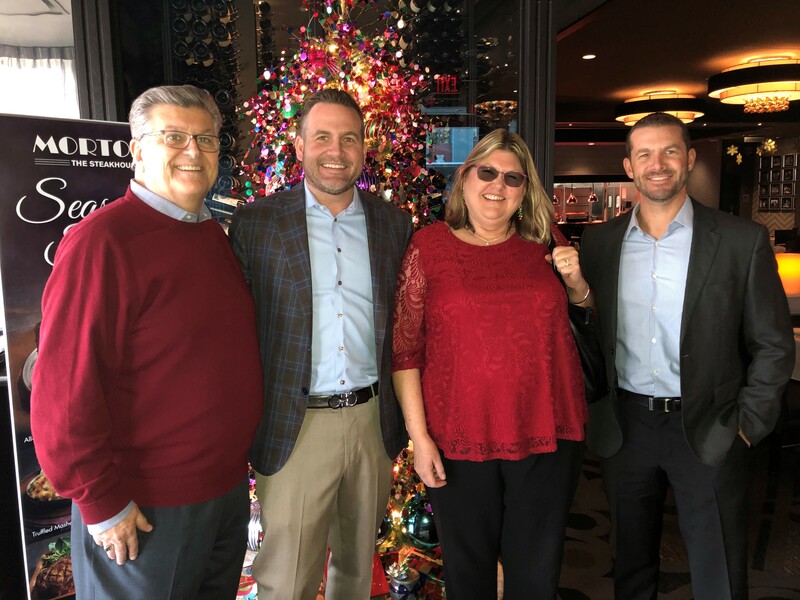 On November 15 in Las Vegas, Moss Adams hosted, as part of their 2018 Health Care Conference, the Transformation in Behavioral Health Panel. The panel of experts included Crestwood’s very own Executive Vice President, Patty Blum, PhD; Patrick Connell, RN, VP of Behavioral Health, Compliance and Government Relations-Boys Town National Research Hospital; Nitin Nanda, MD, Founder, Chairman and CEO, Aligned Telehealth; and Brandon Staglin, President of One Mind. The panel was moderated by Shawn Coughlin, Executive VP for Government Relations and Public Policy, National Association for Behavioral Healthcare. The panel session focused on milestones occurring in behavioral health and how these changes are disrupting traditional models with respect to access to care, research, access to care, lessons learned and exciting new developments for the future, including mental health apps. Thank you Patty for your excellent and invaluable contribution to the panel discussion and doing an amazing job representing Crestwood! You make us all proud! On November 29, Copeland Center presented a webinar, Create Workplace Wellness, that featured Crestwood and how we are working to transform our workplace and workforce to a place of Wellness by creating "Organizational Wellness Landscape," (The OWL Project). We spend a large part of our life at "work" and we all know how crushing an unhappy workplace can be. Determined to create an environment of support and hope - Crestwood has made the extraordinary decision to bring wellness to its staff. It's an incredible story of an organization who recognizes staff must practice wellness in order to share it with the people it serves. Patty Blum, Crestwood Executive Vice President and Greg Parnell, ALWF, and Crestwood’s Health and Wellness Facilitator represented Crestwood and shared the amazing work our staff are doing for wellness on our campuses. This webinar will help you rethink how you want your workplace to look. On November 2, in collaboration with Resilience Inc., Crestwood was proud to host the Peer Workforce Summit that was held at the Hilton Garden Inn in Fairfield. The Summit, funded by a MHSA OSHPD grant, provided a wonderful opportunity for participants from Crestwood, Dreamcatchers and local behavioral health county representatives, to network with colleagues, listen and learn from experts in the field, and gain an understanding on integrating peer personnel in the workforce. Pioneers in recovery and resilience, Gene Johnson and Lori Ashcraft of Resilience Inc., spoke at the Summit and the Keynote Speaker, Dr. Larry Davidson, a Professor of Psychiatry and the Director of the Program for Recovery and Community Health at Yale University, presented “Inclusion, Integration and Education of a Peer Workforce in a Behavioral Health Setting.” The event was a great success and inspired participants with new ways to effectively increase, retain and support our peer workforce. Crestwood Presents at the Fall 2018 CASRA Conference! Crestwood once again made a big splash at the Fall 2018 CASRA Conference that was held October 30 in Pasadena. CASRA conferences are regarded as one of the state’s finest training opportunities to promote the wellness, recovery and rights of people with mental health issues. Rhonda VanCleve, LCSW, and Sarah Wilt, MPH, from our Bakersfield campus, presented “Empathy Enhancement for Behavioral Healthcare Staff” and Alec Atkin, Crestwood’s Director of Performance Improvement, presented “Using Six Sigma to Solve Difficult Client Care Issues.” Both presentations were very well-attended and well-received by participants. Dreamcatchers Celebrates their 5th Annual Client Recognition Event! On October 18th, Dreamcatchers Empowerment Network came together at the Hilton Garden Inn in Fairfield, to celebrate the success of their clients as they recognized those who have been hired during the past year. 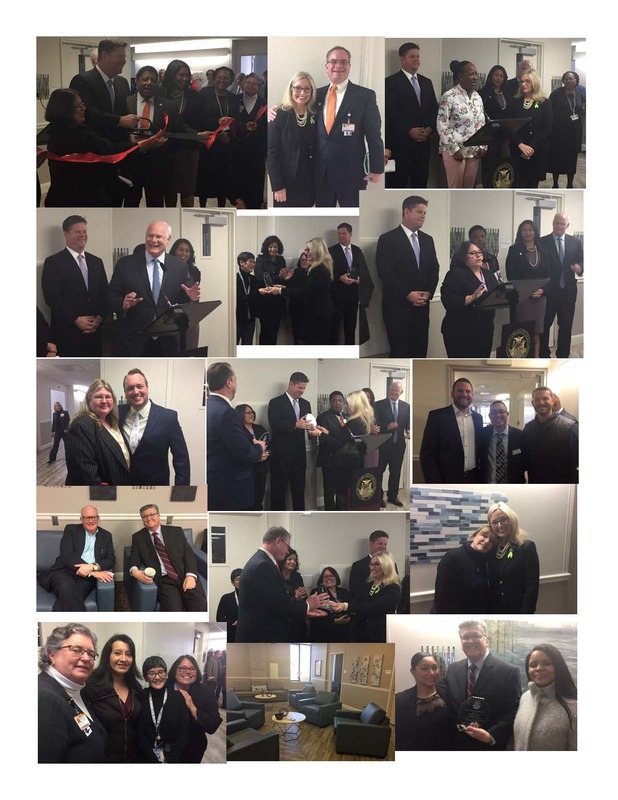 This year’s Client Success Recognition Event’s theme was “Life is like a Story, Make Yours a Bestseller.” The event was another huge success with more than 80 clients, families, and employers, along with state and county officials, attending. The day was filled with wonderful stories of perseverance and inspiration from their clients as they shared how Dreamcatchers and finding employment has changed their lives and family members who shared how being employed has changed their loved ones’ lives. The event also included a silent auction and raffle. This celebration event provides a great way to honor and shine the spotlight on Dreamcatchers’ clients who have worked so hard for all their accomplishments and how they have taken charge of changing their lives. Congratulations to all the Dreamcatchers and their continued success! Crestwood San Diego’s MHRC Expansion, Hummingbird Healing House Open House! 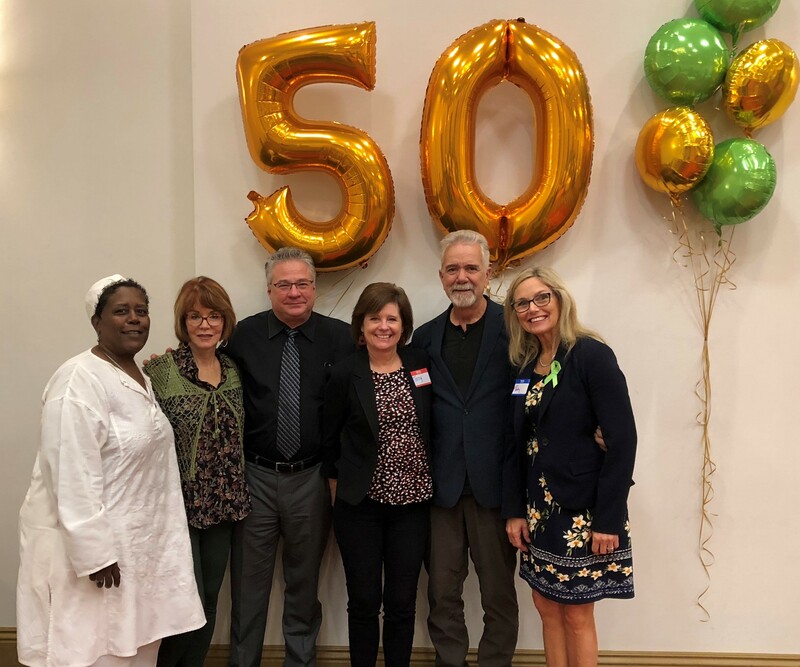 On September 25, Crestwood San Diego proudly hosted its Open House, along with its 50th Anniversary campus celebration, for the expansion of their MHRC services and the opening of their new 16-bed transitional residential treatment program, Hummingbird Healing House. Crestwood San Diego’s campus, located on the former Promise Hospital site, has now been totally renovated to create a beautiful, homelike environment throughout the entire building. The renovation has expanded the MHRC by 67 beds and for a total of 109 MHRC beds and created Hummingbird Healing House, a Social Rehabilitation Program, that offers clients a gentle place to land and a supportive place to launch with their Full-Service Provider team. Crestwood San Diego’s staff provided tours of the campus, so attendees could experience Crestwood’s healing environment first-hand, which includes soft, soothing paint colors and art work, serenity room, comfort room, welcoming room, dining room, library, spa, mindfulness garden, computer lab, gym, living room and sitting room which features television screens that show virtual fish tanks for creating a relaxing environment. More than 200 people attended the Open House and guests included clients, family members, Home Office staff, community partners and stakeholders, San Diego County Behavioral Health Services staff, a representative from the San Diego Mayor’s Office, a local news station, KPBS and representatives from their local councilmember’s office who provided them with a certificate of acknowledgment for their role and partnership in the community. Congratulations Crestwood San Diego on a stunning, welcoming campus that will now be able to provide recovery services to more clients in need in the community and welcome Hummingbird Healing House to our Crestwood family! Compliments to the Chef at Freise Hope House! Clients of Freise Hope House in Bakersfield are among an especially cared for local population in need of special supports while transitioning from challenge riddled lives, to roads with brighter futures. Those fortunate enough to receive Crestwood's services at this particular location always marvel at the exceptional quality of the menu items prepared by an amazingly talented and compassionate modest member of the staff, simply known as "Daniel G."
No words of praise can begin to describe the culinary expertise and sheer gift of yummy delight this gentleman demonstrates daily with his natural talent in the kitchen. Not only are the dishes carefully prepared to be highly nutritious, but simply put, they set the gold bar standard for flavorful goodness! Always delicious, the portions are generous, created especially fresh and perfectly seasoned. Daniel's professionalism and modest reputation are but two stand out characteristics describing someone who's both valued by guests and his fellow staff members. Hats off to an especially bright star who inevitably makes the stay at this transition home a favorably memorable one! Extremely well done, Daniel! Crestwood opened our first Crisis Stabilization Unit (CSU) and services for Solano County in Fairfield on June 28th. The CSU will serve adults and children, providing a warm, loving, safe space for a person in crisis. For many, it will be the first encounter with the mental health system. The CSU will give Crestwood staff the opportunity to demonstrate every day our flexibility value by bending without breaking, shifting and modifying the day to meet the needs of each individual that comes through the doors. We have transformed the environment into a warm, inviting place for children with gaming chairs and provided a comfortable, serenity space for adults. The CSU exudes creativity and recovery from the welcome area, to the yard, to the full staff that includes peers, compassionate nurses, clinicians and physicians that have been trained to engage and meet each person exactly where they are at. Welcome Crestwood CSU to our family! Mental Health Matters Day at the Capitol! 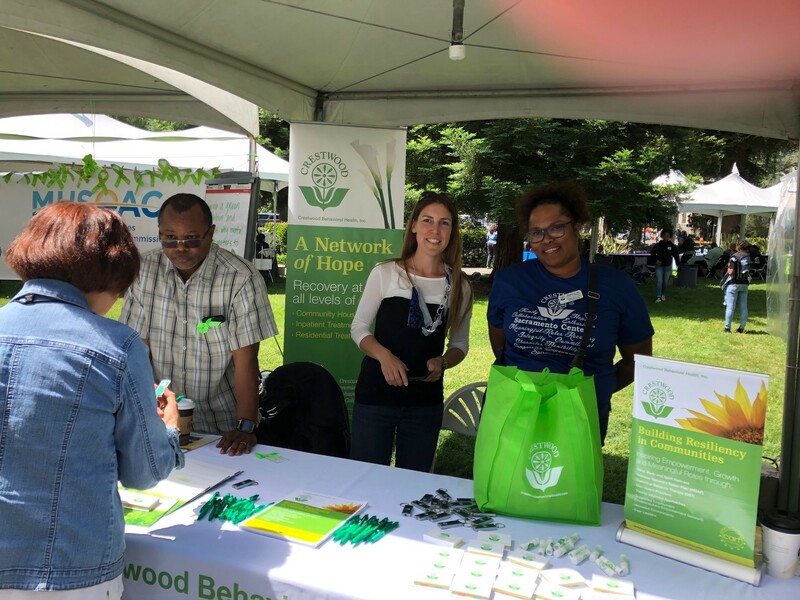 On May 23rd, Crestwood was proud to be one of the sponsors for Mental Health Matters Day at the Capitol in Sacramento. Mental Health Matters Day brings together the community and organizations to help better the lives of those living with mental health challenges and strengthening the movement to end stigma. The event featured speakers, including Darryl “DMC” McDaniels from Run DMC, who shared his story of lived experience with mental health challenges. Also, an emotionally powerful exhibit called Send Silence Packing, featuring backpacks and personal stories from those who have lost a loved one to suicide, was featured across the Capitol lawn. A special thanks to Sacramento Center Campus staff (Adrain Smith, Rachel Harris and Shaniece Hill) who came out to help staff our table and talk with people, as well as bringing some of their clients to experience the event. It was a wonderful day! 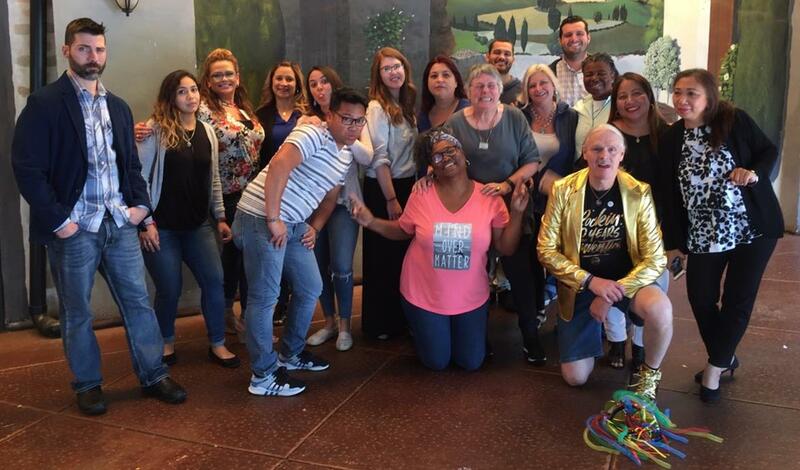 Our Crestwood Behavioral Health Bakersfield campus was nominated and awarded the “No Place Like Home” award during the 19th annual Academy Awards celebration in May for Mental Health Awareness Month. The event, sponsored by Kern Behavioral Health and Recovery Services, along with several community partners, such as NAMI of Kern County, celebrates clients in recovery, mental health professionals, and facilities that embody recovery, while reducing stigma during this annual celebration. Crestwood Bakersfield was not only honored to attend this wonderful event, but to take home an award as well! Our clients truly are at home with us in Bakersfield. Another winner to celebrate this month is our very own Sukhdeep Kaur, RN, BSN, Director of Nursing for the Bakersfield MHRC. 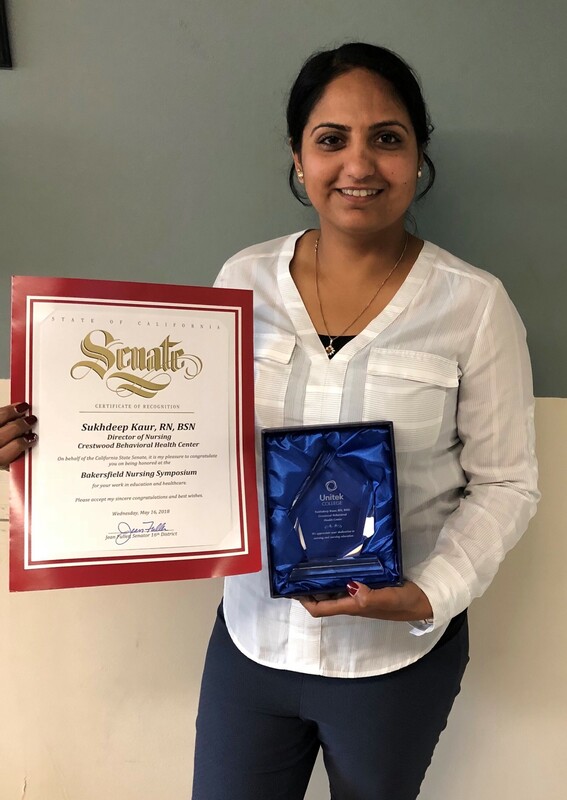 Sukhdeep was awarded the State of California’s Certification of Recognition for her work in education and healthcare. What a wonderful way to end Nurses Week! Way to go Sukhdeep, we are truly so proud! Crestwood San Diego Celebrating at the Behavioral Health Awards! On June 1, staff from Crestwood San Diego, Crestwood Chula Vista and the Sacramento Home Office, gathered at the San Diego Mission Valley Marriott to attend the 32nd Annual Behavioral Health Recognition Dinner. The event is a chance to celebrate and recognize individuals and groups who provide outstanding service in San Diego County’s behavioral health field. Crestwood was also proud to be one of the event’s sponsors. 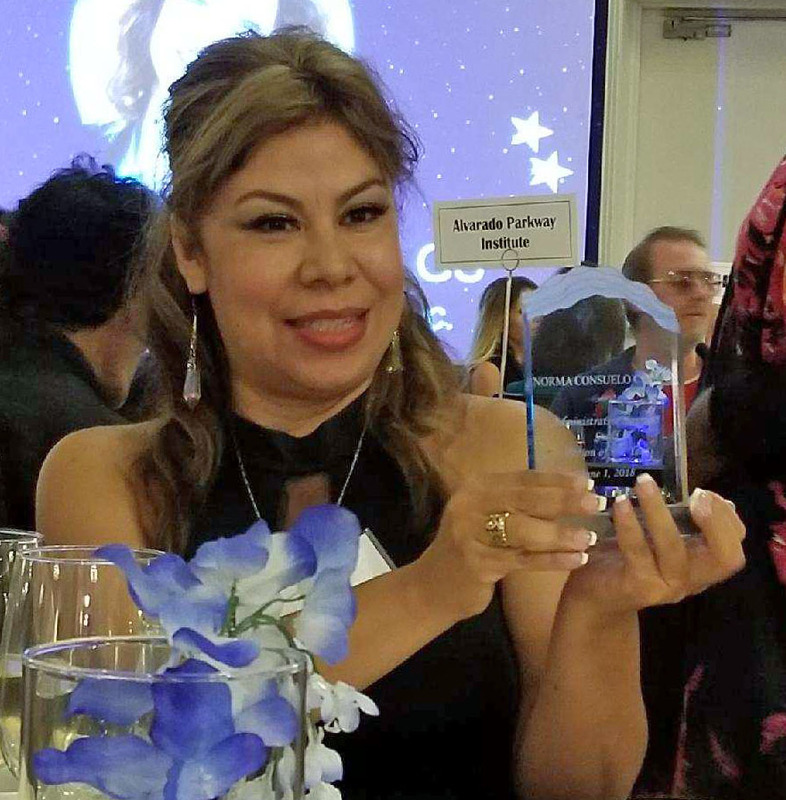 At this year’s event, Crestwood San Diego’s Norma Crespo was awarded Administrative Professional of the Year! In front of more than 600 people, Norma accepted her award and gave a moving speech that focused on her 25- year journey with Crestwood. She talked about how she started as a dishwasher at the Napa Valley campus and worked her way up to the Director of Administrative Services at the San Diego campus. She shared how she learned English by interacting with our clients, who she said were her teachers. She also put herself through school, so that she would be eligible for promotion opportunities. Norma is an inspiration and a living example of hard work and perseverance. We are so proud of you Norma! Crestwood Receives its 6th CARF Accreditation! When an organization sets its goals to meet higher standards than is required by licensing agencies, payer sources, community stakeholders and industry standards, and then goes on to achieve those goals, it is an extraordinary accomplishment. Crestwood Behavioral Health Inc. is proud once again to have achieved just that accomplishment. In March 2018, Crestwood received the highest-level of Commission on Accreditation of Rehabilitation Facilities’ (CARF) Three-Year Accreditation of our 24 community programs, accounting office and corporate office. This accreditation decision represents the highest level of accreditation that can be awarded to an organization and shows the organization’s substantial conformance to the CARF standards. An organization receiving a Three-Year Accreditation has put itself through a rigorous peer review process. It has demonstrated to a team of surveyors during an on-site visit its commitment to offering programs and services that are measurable, accountable, and of the highest quality. Crestwood’s was recognized for many of our accomplishments during the survey. Please click on "Get" below to read more on our highlighted strengths from the survey. Crestwood at the CASRA Conference! 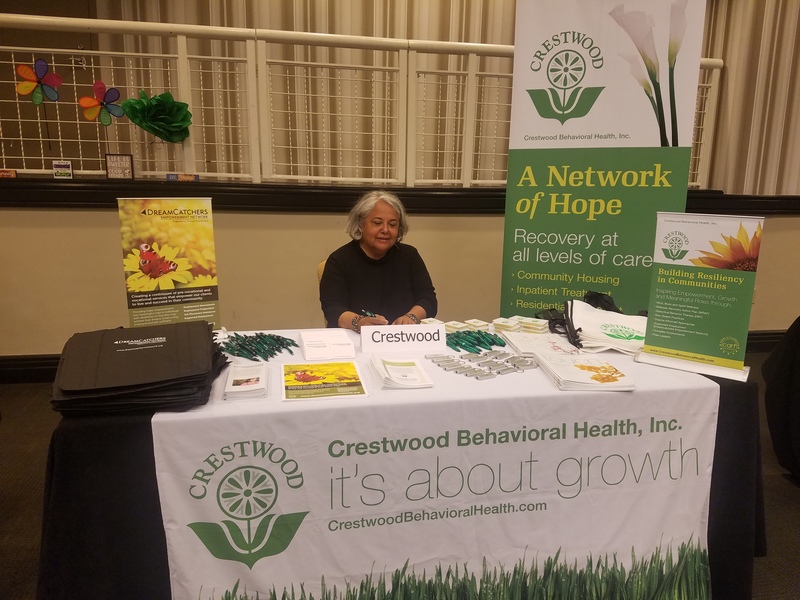 Crestwood was a big presence at this year’s California Association of Social Rehabilitation Agencies’ (CASRA) Spring Conference that was held in Concord on May1 and 2. CASRA conferences are regarded as one of the state’s finest training opportunities to promote the wellness, recovery and rights of people with mental health issues. Crestwood presented four of the 30 workshops that participants could attend and they included “Employment: Reaching your Dreams” by Regina Kaiser (Dreamcatchers) and Ruth Gonzales (San Francisco Healing Center); “Healing Stigma, Prevention & Intervention” by Patty Blum (Sac Home Office) and Ruth Gonzales; “Improving Resiliency for Peers and Professionals Working in Recovery” by Rhonda VanCleve, Tina Healy and Sarah Wilt (Crestwood Bakersfield); and “Using Six Sigma for Performance Improvement in Behavioral Health” by Alec Atkin (Sac Home Office) and Joel Mensonides (San Francisco Healing Center). All presentations were very well-attended and well-received by participants. Lee Ann Labrie Receives Leadership Award! Congratulations to our very own Lee Ann Labrie, Administrator at Crestwood Manor, Fremont, for being awarded the 2018 Eli Pick Facility Leadership Award by the American College of Health Care Administrators (ACHCA)! This award is based on the premise that a facility’s excellence reflects leadership excellence and fewer than 11% of facilities nationwide qualify. The leadership award was celebrated during the awards luncheon at the ACHCA’s 52nd Annual Convention in Orlando, Florida on April 24th. Lee said on winning the award, “The truth is, I am embarrassed to accept an award with just my name on it. There are more than 240 employees at Crestwood Manor and their names should be next to mine. They are smart, dedicated and surround me with their support. They are the true heart, soul and brains of our facility. I am filled with gratitude each day that I am fortunate enough to be part of such a wonderful team. It is because of them, that we have received this recognition. They are my inspiration for striving to become a better leader and human being." Crestwood San Francisco Healing Center’s Open House Celebration! On March 5th, Crestwood’s newest 54-bed MHRC, San Francisco Healing Center, held its Open House that celebrated the groundbreaking partnership between Crestwood, UC San Francisco, Dignity Health, the San Francisco Mayor’s Office, San Francisco Public Health and San Francisco Behavioral Health. The San Francisco Healing Center is located on the 5th Floor of St. Mary’s Medical Center and overlooks the beautiful Golden Gate Park. The Open House kicked off with a press event and ribbon cutting which began with a blessing from Sister Mary Kieffer, from St. Mary’s and included speakers San Francisco’s Mayor Mark Farrell; Barbara Garcia, Director of San Francisco Department of Public Health; Lloyd Dean, President & CEO of Dignity Health; Mark Laret, President & CEO of UCSF Health; and Patty Blum, Crestwood Executive Vice President. More than 250 people attended the Open House. San Francisco Healing Center staff provided tours of the campus so attendees could experience Crestwood’s beautiful homelike, healing environment first-hand, which includes our soft, soothing paint colors and art work, serenity room, comfort room, welcoming room, dining room, library, living room and sitting room which features television screens that show virtual fish tanks for creating a relaxing environment. San Francisco Healing Center’s innovative program continues Crestwood’s commitment to providing mental health clients a continuum of care that puts them on the road to recovery, while restoring a sense of hope, empowerment, community/natural support inclusion and realized potential. “With this new program, we will be able to bring people home, and to provide treatment to San Franciscans in their own community,” said Barbara Garcia. Crestwood is honored to be able to provide these recovery services for our clients in San Francisco. Welcome San Francisco Healing Center to the Crestwood family! 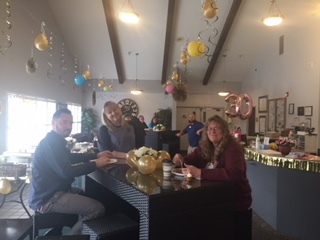 In February, Crestwood Wellness & Recovery Center in Redding celebrated 30 years of service in the Redding community. The campus celebrated with a luncheon, raffles, t-shirts and a variety of special gifts. Administrator, Nicoletta Groff, said, “I’m grateful to work for a company and staff that have such incredible compassion for the people we serve.” Congratulations Crestwood Wellness & Recovery Center!! Congratulations Crestwood Peer Support Program Graduates! 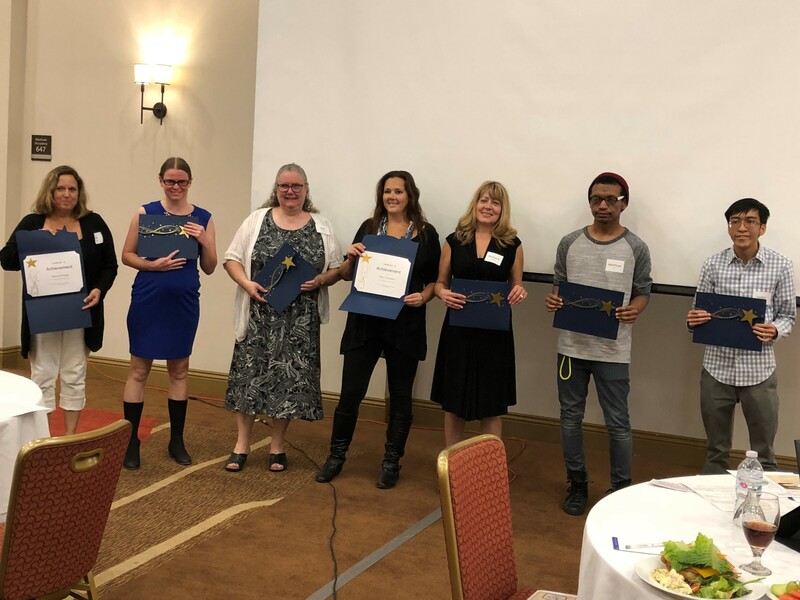 It is with great excitement and pride that Crestwood congratulates our staff who are recent graduates of the Peer Personnel Training Program with Resilience, Inc. This internationally recognized college-level program enhances the peer support skills of our staff, while empowering them to be more self-directed and competent in providing recovery and resilience services to the people we serve. In addition, graduates have an opportunity to use their new skills to enhance service delivery and strengthen the recovery and resilience philosophies and practices within Crestwood. 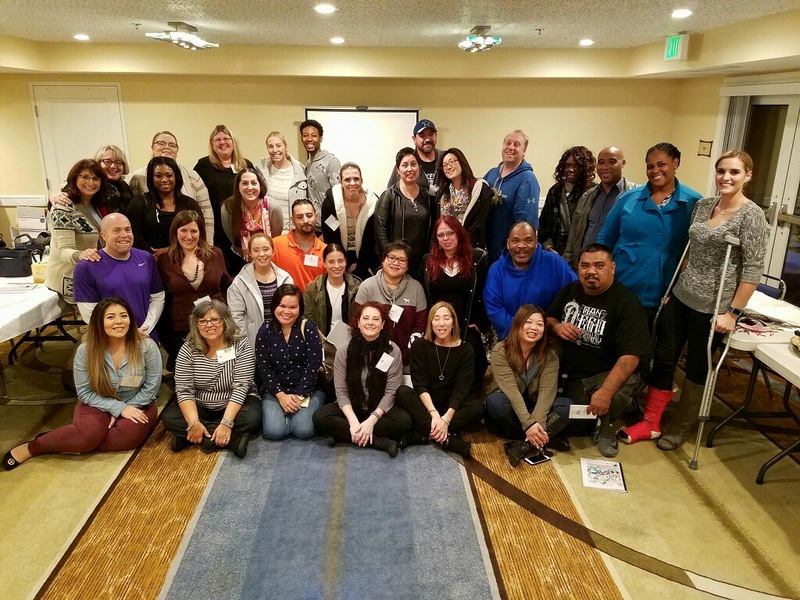 In 2017, 37 staff from American River, Angwin, Chula Vista, Dreamcatchers, Eureka, Freise, Fresno Bridge, Kingsburg, Pleasant Hill, Sacramento Center, Sacramento Home Office, San Diego, Solano and Vallejo completed an interactive online program; and in February 2018, 20 staff from our new San Francisco Healing Center completed a 2-week, 80-hour onsite program. The training included required coursework and electives (peer practices, case management, crisis response, triage, resilient learning and leadership, cultural competency, and more). Graduates have also completed a 6-month mentoring phase or are in the process of completing their mentoring. We are very grateful for our Peer Support Services Staff and their commitment to building resilience on a foundation of recovery and whole health. As we commence our 50th year, we celebrate many successes and we recognize some losses. In late December, we had a significant Crestwood loss of one of our Board Members, shareholders and leaders, with the passing of MaryLou Glantz, at 87 years old. 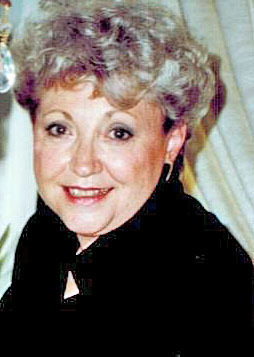 MaryLou was with Crestwood for more than 30 years and championed many causes. She exemplified our Crestwood values and was above all, graceful. She was pivotal in opening doors for women in leadership at Crestwood. She was our first female executive and provided a roadmap for women to step into leadership roles in our organization. MaryLou served as the Vice President of Employee Relations, a member of the Board of Directors, and became Executive Vice President in 1997. This was an extraordinary achievement at the time for a woman in this field. She recognized the balance for women in supporting their families, while helping Crestwood become the leading provider of behavioral health throughout California. Her legacy also includes being a champion for employees, she could find the synthesis of two sides to every story. Among her many talents, MaryLou also brought her ability to pull diverse groups of people together and created several taskforces and committees to make purchasing decisions, branding choices, and even to come to consensus on our goals, values and mission. These groups included people from the field, Administrators, and Home Office staff. Her grace carried many initiatives forward and her energy and dedication brought them to fruition. As Crestwood celebrates 50 years, we remember MaryLou who left us with a rich legacy of achievements to be proud of today, but with her passing, a loss we feel deeply. For the first time this fall, Crestwood as an organization was excited to participate in the One Warm Coat Drive (www.onewarmcoat.org) to collect coats to help those in need in our community to stay warm this winter. One Warm Coat is a national non-profit organization that works to provide a free, warm coat to any person in need. 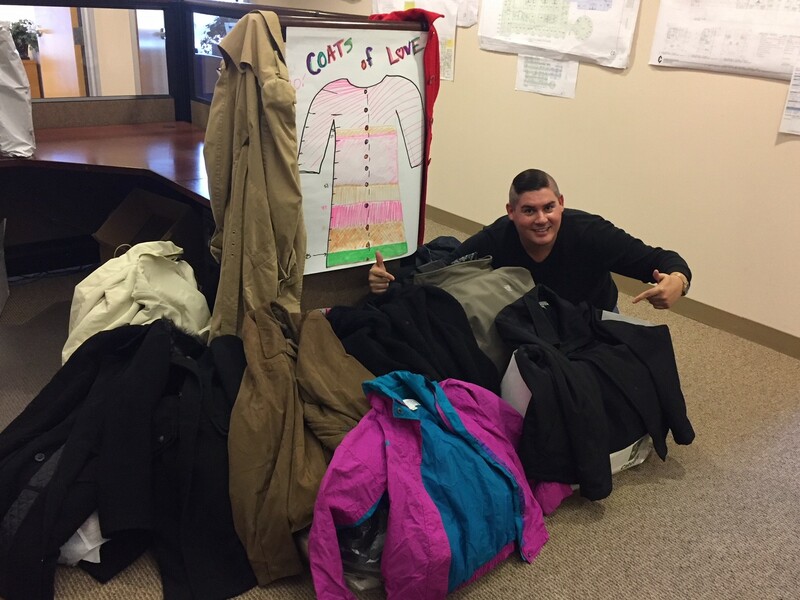 More than 20 Crestwood campuses participated in the coat drive, collecting a total of 776 coats! The month-long drive was also a competition between campuses, inspired by the generosity of American River Administrator Nancy Soncrant, to see who could collect the most coats. Coats were collected from Crestwood staff, clients and visitors and then they were donated to local charities in each community. Congratulations to the winners who collected the most coats this year-Freise HOPE House in Bakersfield and the Sacramento Home Office, each collecting 90 coats! Idylwood Care Center came in third place with 50 coats collected and $200 in donations. Nancy said, “This drive really got us in the spirit of giving. As leaders in the community, it is important that we spread our impact beyond our individual campuses – we have the power to make a larger difference, which I think this competition proved.” Thank you to all those in the Crestwood community that donated, and keep your eyes out for future collection drive competitions! We are making a difference in our communities! It is with great enthusiasm and anticipation that we announce our newly trained Crestwood Advance-Level WRAP Facilitators (ALWFs). The ALWF application, training and mentoring process is a commitment that comes with great passion and excitement from our newly trained staff. In October, a select group of Crestwood staff attended the 5-day ALWF Course and learned how to train and prepare new WRAP Facilitators. These ALWFs are experienced facilitators with an in-depth knowledge and mastery of both WRAP and facilitation skills. Following the training, they will continue with the AWLF mentoring process in developing the skills and knowledge to train others to do this work faithfully and in a manner that is consistent with the evidence-based practice of WRAP. Please join us in congratulating our inaugural Crestwood ALWF class, and look for them on your campuses as they support our WRAP Initiative and OWL Project! Awareness Month, Dreamcatchers Empowerment Network celebrated the success of their clients as they recognized those who have been hired during the past year. The Dreamcatchers’ annual Client Success Recognition Event was held at the Holiday Inn in Sacramento and was a huge success with clients, families, and employers, along with state and county officials attending. The day was filled with wonderful stories of perseverance and inspiration from their clients as they shared how Dreamcatchers and finding employment has changed their lives. There was not a dry eye in the house as family members shared how being employed has changed their loved ones’ lives. This celebration event was a great way to honor and shine the spotlight on Dreamcatchers’ clients who deserve every bit of praise for their accomplishments and how they have taken charge of changing their lives. Congratulations to all the Dreamcatchers and their continued success! The Crestwood Olympics Celebrates its 10th Anniversary! When a vision is followed up with decisive action everything is possible. Ten years ago after the 2007 Summer Olympics in China, our tenured Activity Director at Crestwood Solano had a vision. She wanted our clients across the company to be able to participate in their own Olympics. 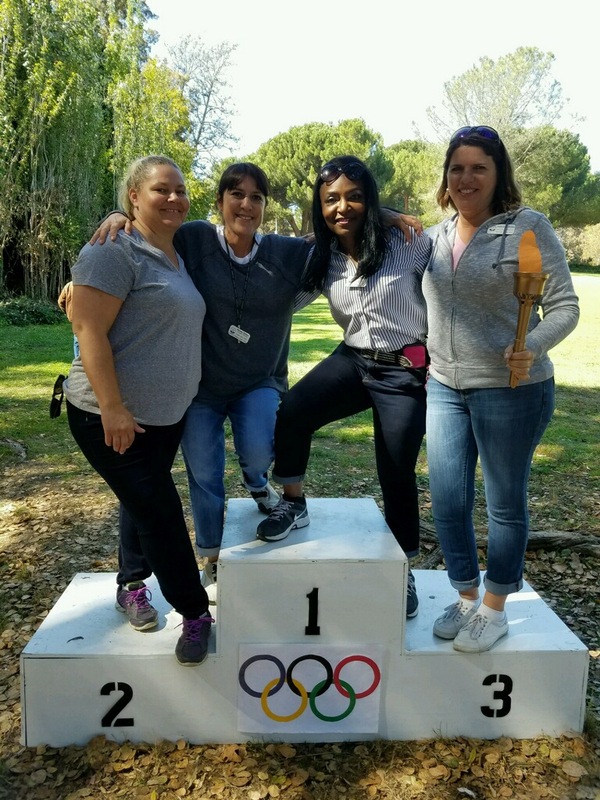 Before you knew it , we had podiums built, games planned, medals ordered, the celebratory lunch planned, and invites sent out to our sister campuses and voilà, we had our first annual Crestwood Olympics at a local park in Vallejo! Every year this event has grown and evolved to include different campuses and new games. The opening ceremony, the music, the passing of the torch, the competitive events, along with the closing medal ceremony, has become part of the honored traditions for this popular annual Crestwood event. Over the years our games have included the javelin throw, the discus throw, the 50-yard dash, the long jump, the relay race, a basketball tournament, and this year we added an obstacle challenge course, with obstacle pieces custom built by our Solano team. The staff from our Crestwood campuses bring their “A” game when it comes to the our Olympics. Each staff person involved is a bright and shining mirror reflecting every single one of our Crestwood values. Our values of commitment and enthusiasm are especially evident every thrilling moment of this event! 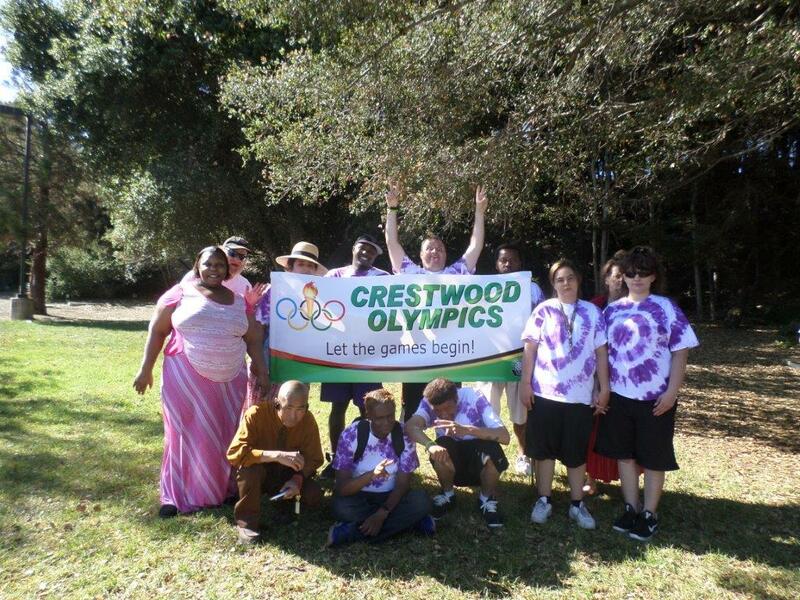 This year marked the 10th Anniversary of the Crestwood Olympics and was attended by seven Crestwood campuses on September 28th. One client told us that he comes to the Olympics, “to give it my all!” This singular comment alone is the motivation that compels us to come together every year for this incredible event and reminds us of what is possible for our clients as they journey forward on the road of hope and recovery. Crestwood Once Again Goes National at the 2017 PRA Summit! 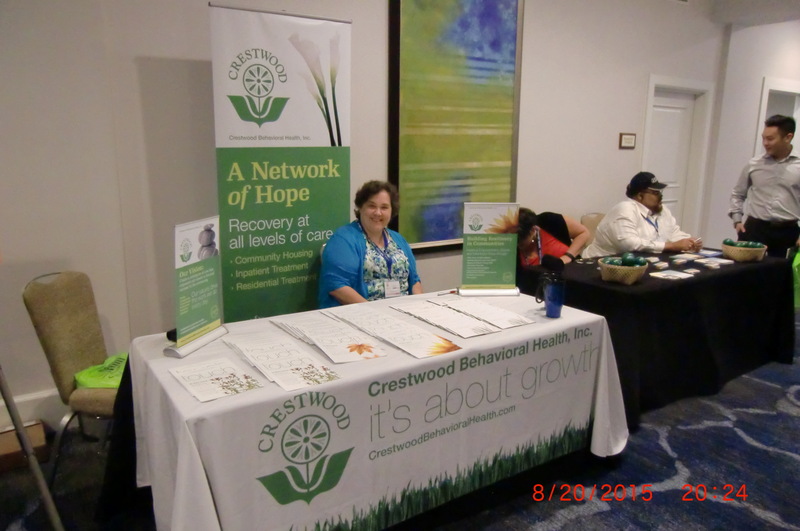 Crestwood was one of the proud presenters at the 2017 national Psychiatric Rehabilitation Association’s (PRA) Wellness and Recovery Workforce Summit that was held June 24-26 in Atlanta, Georgia. The 2017 Wellness and Recovery Workforce Summit offers a comprehensive line up of in-depth psychiatric rehabilitation training and enhanced networking opportunities and special events to provide attendees with the tools they need to help others more effectively. Patty Blum, PhD, Crestwood Vice President of Operations, Ruth Gonzales, ALWF, Crestwood Wellness and Recovery Educator and Regina Kaiser, Executive Director of Dreamcatchers Empowerment Network, presented at the event with two presentations- Healing Community Trauma Through Resiliency and Healing Through Spiritual Practices with a Trauma-Informed Lens. Both presentations were very well-received from participants. Crestwood was also one of the event’s sponsors and had a display table in the exhibitor hall, where Patty, Ruth and Regina, provided participants with information about Crestwood and Dreamcatchers, sharing the wellness and recovery work we do in building resiliency by providing our staff with the most advanced Evidence-Based Recovery Services training that is integrated into all levels of care for our clients. More than 1,000 individuals from around the world attended the conference. Thank you Patty, Ruth and Regina for doing such an amazing job representing Crestwood and Dreamcatchers! Crestwood’s Amazing Team at WRAP Around the World Conference! The annual Copeland Center for Wellness and Recovery’s WRAP Around the World Conference was held June 5-7 in Sacramento. This conference brought together people in recovery, peer specialists, professionals, and supporters. It was a time to share with people from all over the world about wellness and recovery skills, strategies, and stories. Crestwood was not only a sponsor of the event, but also presented the Organizational WRAP Landscape (O.W.L.) project with the Copeland Center. We are so honored to have such an amazing, innovative and talented team representing Crestwood! On May 22 Becca Ollivier (Administrator), Ronald Cordy (Recovery Educator), and Patty Blum (Executive Vice President), presented Freise HOPE House’s approach to crisis services as part of the Substance Abuse and Mental Health Services Administration’s (SAMHSA) National Center for Trauma-Informed Care and Alternatives to Seclusion and Restraint (NCTIC) webinar series, Trauma-Informed Innovations in Crisis Services. This webinar was the second in the six-part series and was an amazing opportunity to showcase to a national audience Crestwood’s peer-operated services and the important role that peers play in the recovery of the people we serve. We are so proud of Becca, Ronald and Patty for their excellent presentation and being incredible representatives for Crestwood! Crestwood Healing Center wins Green Business Awards! Congratulations to Crestwood Healing Center Pleasant Hill for winning not only the CoolCalifornia Small Business Award that recognizes California businesses that have made notable, voluntary achievements in reducing their climate impact, but also Pleasant Hill Community’s Green Business Award! 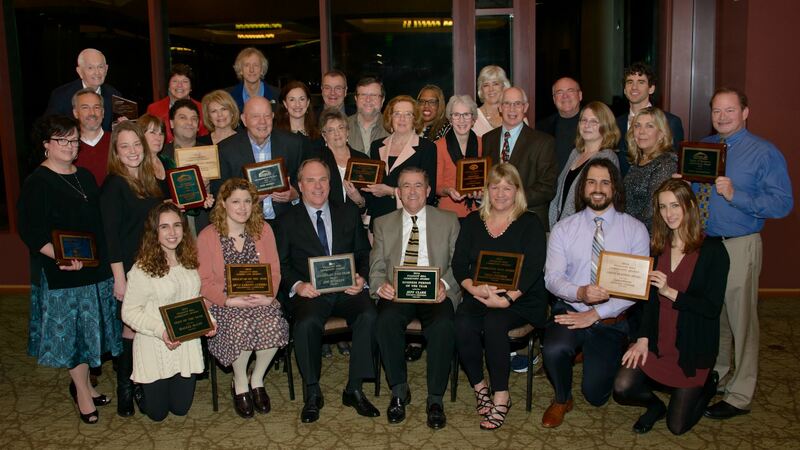 Crestwood Healing Center received the Green Business Award at the 46th Annual Pleasant Hill Community Award Ceremony that was held on February 21 and received the CoolCalifornia Award on March 20 in Sacramento. Both awards are in recognition of Crestwood Healing Center’s Green Machine team that implemented many sustainability practices and changes, saving more than two million gallons of water and thousands of dollars by reducing usage of throwaway items such as plastic cups, paper napkins and paper towels. Their staff and residents also participate in community cleanup activities and do community education. Way to go everyone at Crestwood Healing Center! You are making a positive impact on our environment! Crestwood Kicks Off the New Year with CRM Training! Crestwood is excited to kick off 2017 with our pilot Community Resiliency Model (CRM) Training that was held the second week in January at our San Diego Campus. Trauma Resource Institute Facilitators led the two-day training where participants learned to not only help themselves, but to help our clients and others within a wider social network. The primary focus of this skills-based, stabilization program is to re-set the natural balance of the nervous system. CRM skills help individuals understand their nervous system and learn to track sensations connected to their own well-being, which is called the “Resilient Zone.” The goal is to help create trauma-informed and resiliency-informed communities that share a common understanding of the impact of trauma and chronic stress on the nervous system and how resiliency can be restored or increased using this skills-based approach. Applying the skills proactively in distressed communities or neighborhoods can alleviate the symptoms of chronic stress by enhancing resiliency and empowering individuals to change their situation. The next pilot CRM training will be held January 23 and 24 at our Crestwood Bakersfield campus. Upon completion of CRM Skills Training, participants may then qualify for our CRM Train-the-Trainer event that is scheduled for February 2017. CRM Training will be a great resource for our clients and staff to help them with their self-care and wellness skills! Zumba Gold Comes to Crestwood! 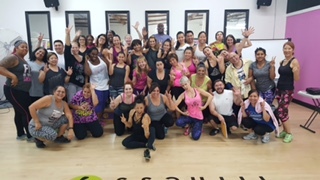 After this latest training, Crestwood now has 35 trained and licensed Zumba instructors, which means that we have a least one or more instructors for each one of our campuses! These instructors will continue to lead the Zumba charge that brings such a spark of excitement and joy in our facilities that helps to energize the mind, body and spirit of those clients and staff who experience and embrace it in their lives. And on an additional note on Zumba at Crestwood-we are very proud to announce that Greg received the Zumba Instructors Network (ZIN) Unsung Heroes Award for November 2016!! The Unsung Hero program recognizes ZIN Members around the world for their outstanding contributions to their communities, and for their ability to inspire others. Congratulations Greg!! You are an inspiration to our clients and staff and are changing lives with your passion and dedication to Zumba! Crestwood’s President & CEO, George Lytal, and Vice President, Patty Blum, were honored on October 5, 2016 for their contribution in providing healthcare for the citizens of Kingsburg and surrounding communities with the opening of the Kingsburg Healing Center. 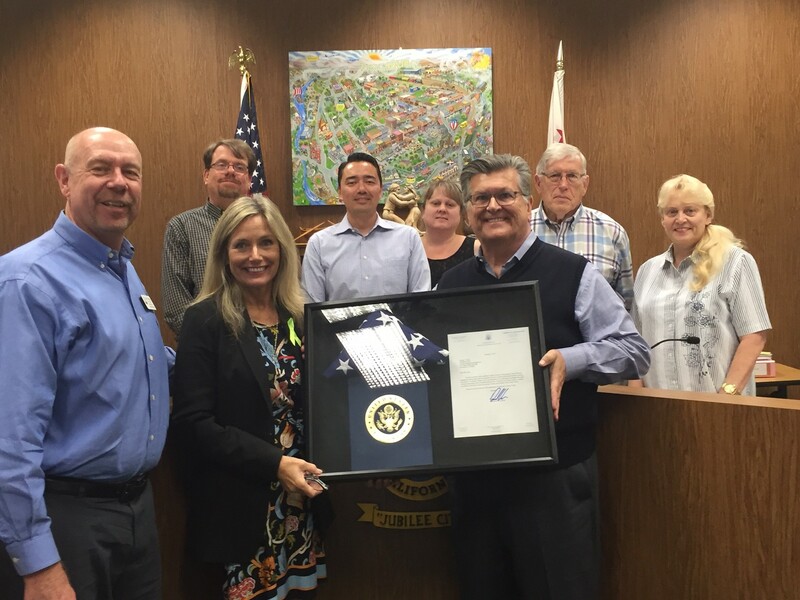 A letter from Congressman David G. Valadao, who represents California’s 21st District, and a flag that was flown over our nation's capital in honor of the Kingsburg Healing Center opening, were presented to each of them at the Kingsburg Tri-County Health Care District meeting. The Congressman's letter states, "This American Flag was flown over our nation’s capital in honor of the opening of the Crestwood Kingsburg Healing Center and the tremendous work of Crestwood Behavioral Health in serving the citizens of California. Thank you for your dedication in overcoming the challenges that comes with providing people with accessible health services. I hope your center is able to continue to provide new hope for the men, women, and children of the Central Valley." Next year will mark the 10th Anniversary of the Crestwood Olympics and they are already gearing up for this exciting event! Let the games begin indeed! (Photo) Crestwood Center Sacramento celebrating the Olympics! Motivational Interviewing Comes to Crestwood! Last week, more than 100 staff from our facilities participated in learning about Motivational Interviewing (MI). The two-day training was led by Kristin Dempsey, LMFT, LPCC, who is a Senior Associate at CIBHS. Motivational Interviewing is a form of collaborative conversation for strengthening a person's own motivation and commitment to change. It is designed to strengthen an individual's motivation for and movement toward a specific goal by eliciting and exploring the person's own reasons for change within an atmosphere of acceptance and compassion. 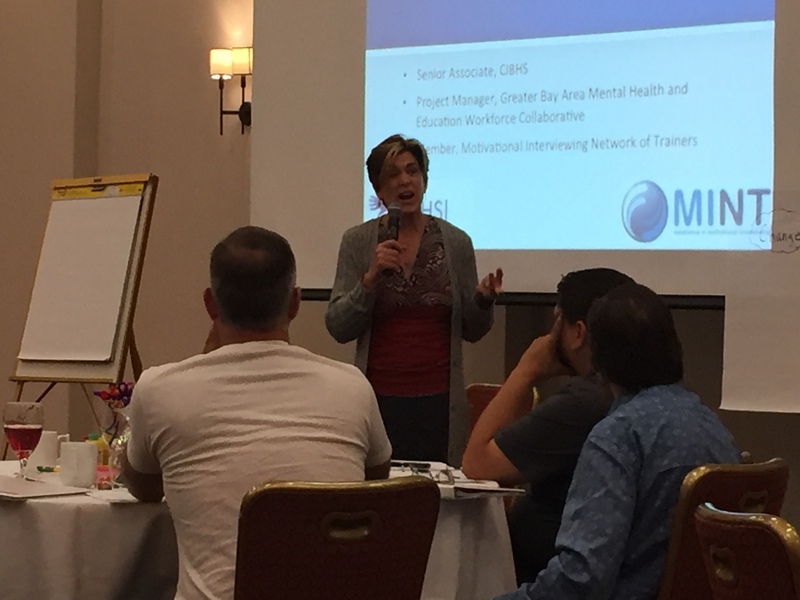 In the two-day training, participants learned about the “spirit” of Motivational Interviewing, the process of change, interaction techniques and strategies. They also learn how to identify, expand and work with “change talk.” Participants also learned that it is a skill that works well with our DBT program. The training then provided participants with the opportunity to practice MI skills in small groups. Those who attended said they loved learning the MI skills and were excited to start using them with our clients to help them reach their recovery goals. MI provides our staff with another important skill that we can infuse into our programs to better serve our clients in their recovery journey. On July 1st Crestwood assumed operations of Freise HOPE (Helping Others through Peer Empowerment) House, a 14-bed Crisis Residential Treatment program located in Bakersfield. Freise HOPE House adds a new type of program to our spectrum of services. As a Crisis Residential Treatment program, Freise HOPE House provides a voluntary, short-term safe place to land for guests experiencing a psychiatric crisis. Our guests are greeted into a warm, homelike environment and we provide them with a variety of recovery-based tools such as Dialectical Behavior Therapy (DBT), Wellness Recovery Action Plans (WRAP) and Trauma-Informed Approaches to help them to manage their symptoms and develop skills to live effectively in the community. The clinical treatment team is comprised of people with lived experience, who are trained and certified peer providers, with a wide-array of clinical expertise. Our guests are also encouraged to utilize our Dreamcatchers Empowerment Network program that provides pre-vocational job skills training. We are very excited to welcome the Freise HOPE House staff and guests to our Crestwood family! To learn more about Freise HOPE House, please visit our Locations Page, under Bakersfield. 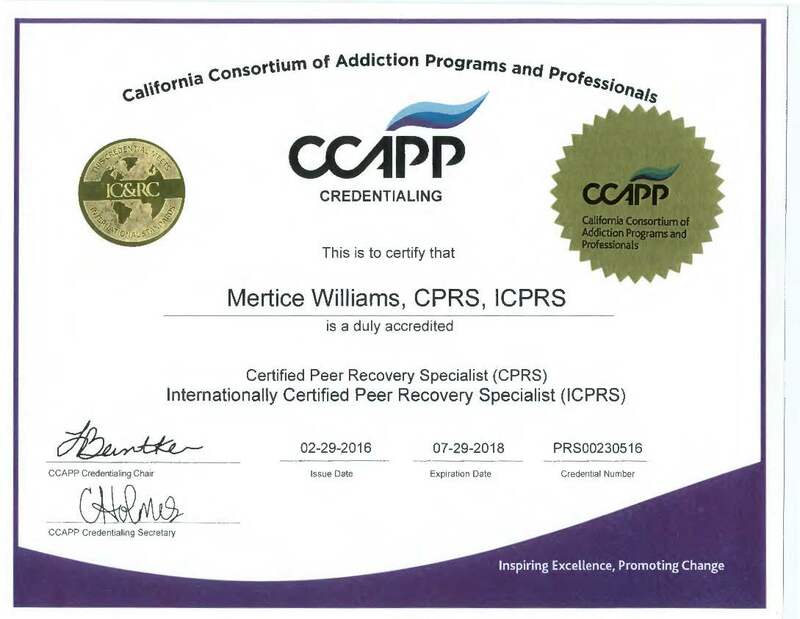 Crestwood is proud to announce that our own Mertice “Gitane” Williams is now a Certified Peer Recovery Specialist (CPRS) and an International Certified Peer Recovery Specialist (ICPRS) by the California Consortium of Addictions Programs and Professionals (CCAPP). Peer Support Services involves advocating, mentoring, educating, and navigating systems, all of which are becoming an important component in our recovery-oriented system of care. The importance of the inclusion of peers with lived experience on teams with degreed clinicians is being increasingly emphasized by the Substance Abuse and Mental Health Services Administration (SAMHSA) – in both addiction and mental health settings. By Gitane becoming a CPRS/ICPRS signifies that she has demonstrated success in four domains- Advocacy, Ethical Responsibility, Mentoring and Education Recovery/Wellness Management, and can draw together resources and talents necessary to make recovery programming an integral part of our Crestwood treatment of services. There is a great demand for people who are Certified Peer Recovery Specialists in California and we are fortunate to now have our very own CPRS/ICPRS on our Crestwood team. Gitane will continue in her role as Crestwood’s Vocational Wellness Educator, consulting with our Dreamcatchers Empowerment Network program, developing resource workbooks, and being a beacon of light within Crestwood and beyond. This is an impressive international accomplishment for Gitane and Crestwood! Crestwood Goes National at the 2016 PRA Recovery Workforce Summit! Crestwood was one of the proud sponsors of the 2016 national Psychiatric Rehabilitation Association’s (PRA) Recovery Workforce Summit that was held May 22-25 in Boston, Massachusetts. The 2016 Recovery Workforce Summit offers a comprehensive line up of in-depth psychiatric rehabilitation training and enhanced networking opportunities and special events to provide attendees with the tools they need to help others more effectively. 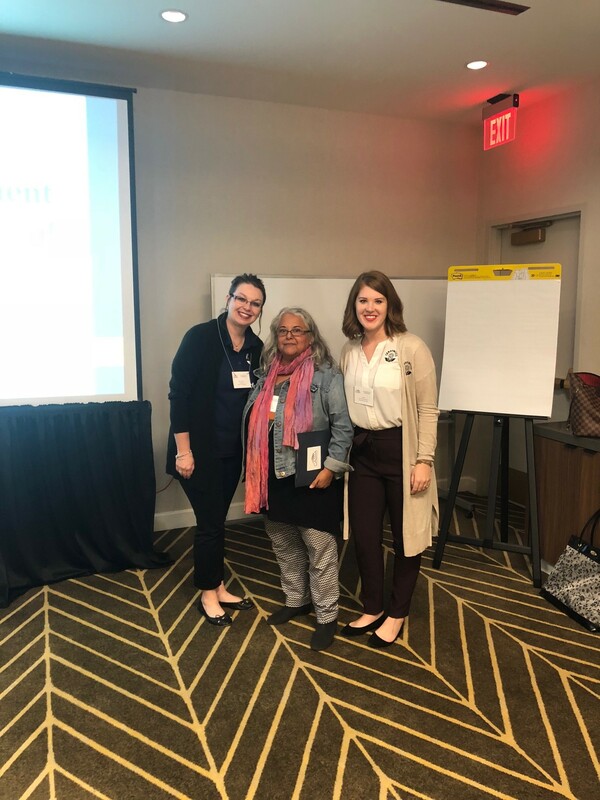 Patty Blum, Crestwood Vice President, and Regina Kaiser, Executive Director of Dreamcatchers Empowerment Network, attended the event to learn more about best practices, evidence-based practices, integrated healthcare, wellness and supported employment. Since Crestwood was one of the event sponsors, we had a display table in the exhibitor hall, where Patty and Regina, when they were not attending a session, provided participants with information about Crestwood and Dreamcatchers, sharing the recovery work we do in building resiliency by providing our staff with the most advanced Evidence-Based Recovery Services training that is integrated into all levels of care for our clients. More than 1,000 individuals from around the world attended the conference. Thank you Patty and Regina for doing such a great job representing Crestwood and Dreamcatchers! On February 1st Crestwood proudly opened the Kingsburg Healing Center, a Mental Health Rehabilitation Center (MHRC), located in the city of Kingsburg in Fresno County. Kingsburg Healing Center is Crestwood’s ninth MHRC. The Kingsburg Healing Center was developed through a public-private partnership between Fresno County and Crestwood in which Crestwood redeveloped the former Kingsburg District Hospital to make it into a beautiful 44- bed facility that serves Fresno County’s clients and families. 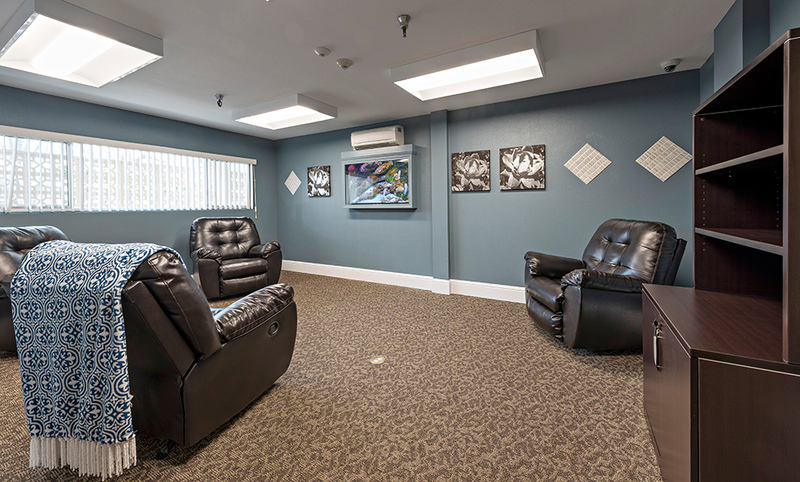 The facility was designed to be a homelike therapeutic environment that aids in recovery for our clients. There are soft, soothing paint colors and art work that are used throughout the facility to help create spaces such as the serenity room, comfort room, welcoming room, dining room, library, living room and sitting room which feature television screens that show virtual fish tanks for creating a relaxing environment. Kingsburg Healing Center’s innovative programs are based on Crestwood’s commitment to providing mental health clients a continuum of care that puts them on the road to recovery. The facility’s mission is to restore a sense of hope, empowerment, community/natural support inclusion and realized potential in each client, as well as psychiatric stabilization. Crestwood is honored to be able to provide these recovery services for our clients in Fresno County. This year Crestwood was one of the proud sponsors of the 2015 Annual NAMI Conference, Bringing Communities Together, that was held in Newport Beach on August 21 & 22. The conference featured a wide-range of workshops that focused on topics such as Advocacy, Criminal Justice, Client and Family Engagement, Affiliate Leadership and Transitional Aged Youth. The conference attracted more than 300 participants. 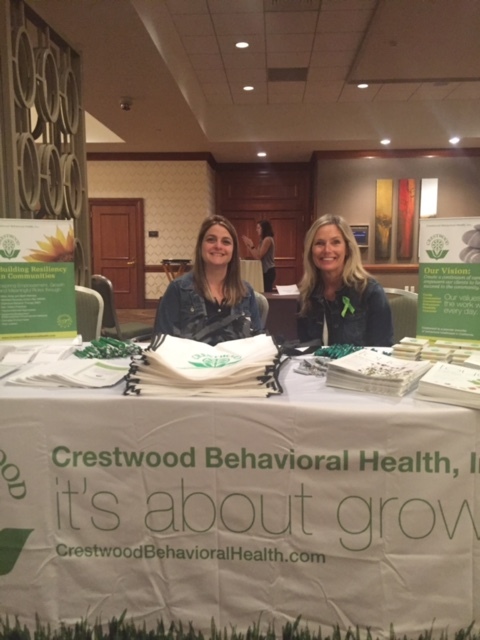 As one of the sponsors of the event, Crestwood had a table in the exhibitor hall where Lynn Gurko, Director of Recovery Services, and Kari Friesen, Director of Communications, handed out brochures and newsletters, and provided participants with more information about Crestwood and the services we offer. It was a great event and Crestwood received an overwhelmingly positive response from participants. When an organization sets it goals to meet higher standards than is required by licensing agencies, payer sources, community stakeholders and industry standards, and then goes on to achieve those goals, it is remarkable accomplishment. Crestwood Behavioral Health Inc. is proud to have achieved just that remarkable accomplishment. On August 20, 2014, Crestwood’s Patty Blum, Vice President, and Mertice “Gitane” Williams, Vocational Wellness Educator, presented a webinar for SAMHSA to a national audience on Trauma-Informed Approaches and Practices: Mutuality and Collaboration. Patty and Gitane focused on Crestwood’s journey to become a Trauma-Informed organization, through education and training of staff and incorporating it into all levels of service company-wide. They also shared information on the important role peer providers play in our facilities, as well as vocation training and job placement through Dreamcatchers Empowerment Network. The presentation introduced Crestwood to a national audience and the response was overwhelmingly positive. Crestwood integrates the Wellness Recovery Action Plan (WRAP), a self-help recovery system designed to decrease symptoms, increase personal responsibility and improve client's quality of life. Crestwood also offers Dialectical Behavior Therapy (DBT) in many of our programs. DBT is a form of therapy developed by Marsha Linehan Ph.D. founder of Behavioral Tech, LLC. DBT is an evidence-based practice used to treat clients with Borderline Personality Disorder. Crestwood enlisted Behavioral Tech, LLC to train our staff in DBT. 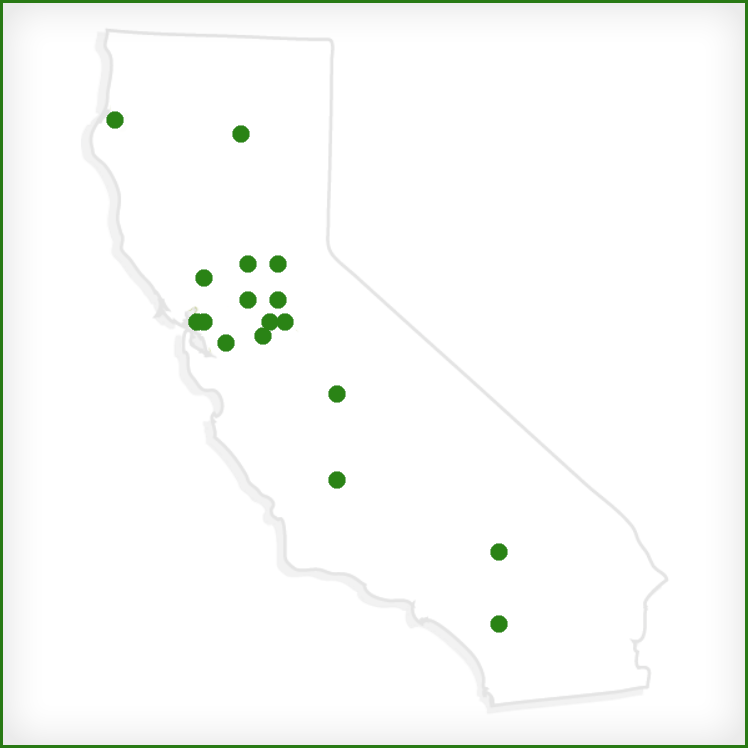 View all our California locations on one interactive map. "Crestwood is the change we want to see in the world. The work that's done here is amazing."